Mount of the Holy Cross Wilderness area. I would recommend this as a four night trip, so that you have time to enjoy yourself, but it could easily be done in two or three by a fit party. 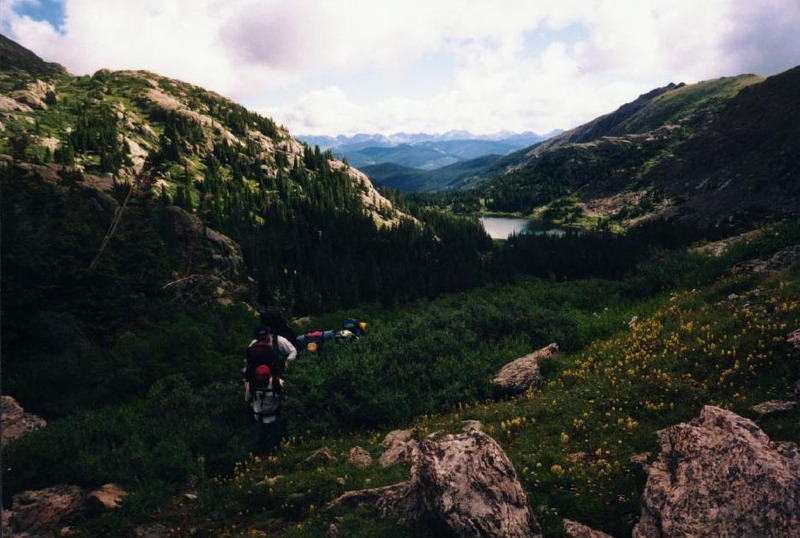 This hike covers some beautiful terrain in the Colorado high country. There are views of mountain summits, clear lakes and creeks with trout, two high mountain passes, water the entire way, and an old mining ghost town and other relics of the mining days gone by. You can combine this with trips up to the summits of Holy Cross mountain or Notch Mountain if you want to. The sections up and over the two passes are a bit strenuous, but the trails are reasonably good the entire way, so this hike isn't too difficult, especially if you take your time. From Denver, drive to Vail on I-70. Just past Vail, take route 24 south through Minturn. About four miles past Minturn is the turn off to the cross creek and half moon trailheads (map 108 west side.) This road is called Tigiwon Road. Tigiwon road is subject to seasonal closures. It is generally closed from the second week in November through July 1st, but these dates vary depending on weather and snowpack conditions. For information, you can call the Minturn office of the US Forest Service at: (970) 827-5715. Start at the Half Moon/Fall Creek Trailhead. (Map 126 East Side at very top of map) On your way up the dirt road to Half Moon, you will pass the Cross Creek Trailhead. Cross Creek Trailhead is where the loop ends, so if you have 2 cars, leave one at Half Moon and one at Cross Creek. If you have only one car, dump everyone off at Half Moon, drive down and park the car at Cross Creek, and hitch hike back up the road to Half Moon. If you are going in the summer, there will be lots of traffic and you shouldn't have any problems getting a ride, as the popular day hike up Notch Mountain begins at Half Moon. (I got picked up within 5 minutes.) A car shuttle isn't really necessary, but makes it more pleasant, as the dirt road from Cross Creek to Half Moon isn't very interesting to hike. From HalfMoon/Fall Creek, follow the Fall Creek Trail South. 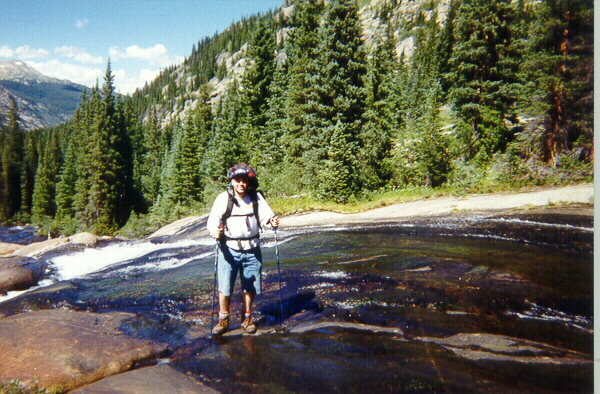 There will be lots of day hikers with you as far as the cut off to Notch Mountain trail. After about four miles, you will reach Lake Constantine, which has a number of nice camp sites, and has good trout fishing. This is a great place to camp and relax. From Lake Constantine, the trail continues South, skirting the lake and steepens considerably, as you head up over the first big pass (Fall Creek Pass) Go up and over Fall Creek pass (strenuous, but beautiful scenery), past the seven sisters lakes. There are good camping spots here or lower down at Hunky Dory Lake. From Hunky Dory Lake, descend to the Hunky Dory Trailhead, then head South then West to Holy Cross City. This is an old 1800s mining town, with several old buildings still standing. Take some time and explore them. Continue South West on a jeep road toward Fancy Pass. Make the steep, strenuous climb up over Fancy Pass. There is lots of old wrecked mining machinery up along this trail. We also found a lot of snow here in August. Once over Fancy Pass, descend down Cross Creek trail, past Treasure Vault lake, then head North, also on Cross Creek trail. Lots of Beaver ponds and the like through this section, as well as abandoned mining stuff. Lots of good camp sites throughout this area. There is also excellent trout fishing at Harvey lake. Past Harvey lake, there are two things to keep your eye open for. One is a section of the trail where the trail goes over a large smooth rocky section. It is difficult to tell where the trail goes here. Do not go left too quickly. The trail to the left, right before the rock section is not the correct path. Continue over the rock section, bearing right until you find the real trail. If you go left, instead of continuing over the rock section, you will end up in a confusing maze of game trails that lead nowhere you want to go. The second thing to keep your eyes open for is a section where the creek flows over a bunch of smooth, wide rocks, some of them eroded into pools and waterfalls. It is a perfect place for sliding and playing in the water; sort of a natural water park. Keep you eye out for it, it is a great place to spend an hour or two splashing, sliding and swimming. Campsites in this section past Harvey lake are fewer and less comfortable, as the trail typically cuts across steeper terrain, and finding a level campsite on either side of the trail can be a bit tricky. The route from here is mostly easy downhill hiking, followed by a short section of uphill leads you at last to the Cross Creek trailhead and your car.